The total area of the Wenshan Prefecture is 31,456 square kilometers (12,145 square miles), the population is about 3,372,000. Under its jurisdiction, there are 1 city, namely Wenshan (wén shān shì 文山市), and 7 counties, namely Yanshan (yàn shān 砚山), Xichou (má lì pō 麻栗坡), Malipo (xī chóu 西畴), Maguan (mǎ guān 马关), Qiubei (qiū běi 丘北), Guangnan (guǎng nán 广南), and Funing (fù níng 富宁). The principle nationalities inhabiting the prefecture are the Zhuang and the Miao. They have different habit of living: Zhuang used to live at the headwaters region, while Miao like to live at the top of a mountain. The ancestor of Miao was good at hunting. The hunters were often injured and bleeding. They chewed a kind of weed and used the chewed weed to put on the wound to stop the bleeding, the wound was sealed just like by a lacquer. 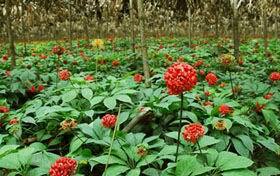 It is now one of the famous medicines in China. Administrative division of this area in history initiated during the Western Han Dynasty (206BC-24AD), when the emperor launched the exploitation of southwestern border area. Kingdoms set up by local ethnic minorities were conquered and replaced by counties and shires newly established by the court. This area stands in the southeast of the Yunnan-Guizhou Plateau backed by the Qinghai-Tibetan Plateau in the northwest. Mountainous region occupies nearly ninety-five percent of the prefecture's territory. The total area under cultivation only accounts for a proportion of seven percent. 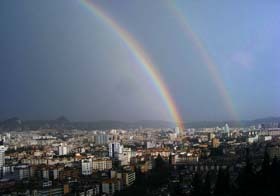 The prefecture enjoys a plateau monsoon climate at low altitude having distributions of six climatic types, ranging from the north subtropical zone to the middle temperate zone. It has clear dry and humid seasons. May to October is the rainy season gathering over eighty percent of wenshan's rainfall throughout the year. Most of the region has a favorable climate without winter chilliness and summer heat. Average temperatures in January and February are respectively 6.5-13.5C (43.7-56.3F) and 17-28.5C (62.6-83.3F). May to September is the best season to visit the prefecture, but umbrella and one or two wraps are necessary in case the weather changes. Wenshan is a place inhabited by eleven ethnic minorities. Therefore, celebrating the festivals altogether with local minorities in the most interesting thing. Danu Festival is the grandest festival of the whole for the Yao ethnic minority. In addition, lotus festival, torch festival and many other local traditional celebrations are undoubtedly temptations for visitors. There are many resources including plants, animals, minerals, and water in Wenshan Prefecture. Except Puzhehei (pǔ zhě hēi 普者黑) in northwest Qiubei County, there are many other scenic spots in Wenshan, including Bamei Village (bà měi cūn 坝美村), Dulong Border Fair (dū lóng biān jìng jí shì 都龙边境集市), Babao Scenic Area (八宝风景区), Laojunshan Scenic Spot (lǎo jun1 shān fēng jǐng qū 老君山风景区), Yuxian Lake (yù xiān hú 浴仙湖), Xihua Park (xī huá gōng yuán 西华公园) and so on. The famous Chinese litterateur Tao Yuanming (táo yuān míng 陶渊明) who lived during the Eastern Jin Dynasty (317-420) once told of a Peach Blossom Valley (táo huā yuán 桃花源) isolated from the hustle and bustle of the ordinary world. People lived there in peaceful, serene isolation. The description of Tao Yuanming came true when Bamei Village was discovered. 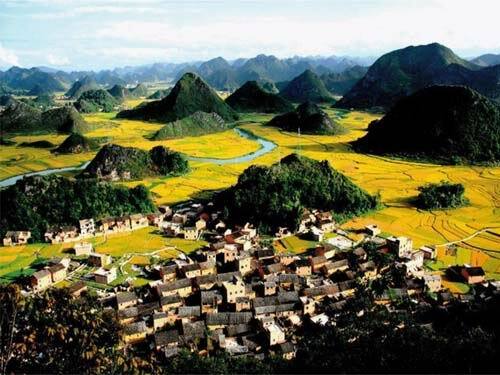 Located thirty kilometers (about nineteen miles) from Guangnan County in Wenshan Zhuang and Miao Autonomous Prefecture, the village is hard to find because of its unique location. It is surrounded by hills, and visitors have to travel by small boat through a long, dark limestone tunnel. In the dark, you feel as if you are going back in time. When you emerge from the tunnel you will be amazed. In a hidden valley, in a grove of green bamboos and old trees, lies Bamei Village. A blue stream gently flows by, and hard-working farmers silently till the green fields. It's a picture of another lost Shangri-la. The local people belong to the Zhuang minority. Bamei means 'cave in the forest' in Zhuang language. It is said that the ancestors of Bamei residents are a Zhuang family of Guangdong Province. Six hundred years ago, they escaped from brutal outlaws and found the cave by chance. They believed it was a perfect place to hide, so later they invited some friends to live with them. Since then, the village had become a Peach Blossom Valley for these virtuous, amicable Zhuang people. They get up when sun rises and go to bed when sun sets. There is no electricity, and no one worries about their job or the future. Life is simple and easy for them. They can do everything for themselves. They plant rice paddies and cotton, spin and weave their own clothes, make bean curd with stone grinders, and even produce their own cooking oil. As long as they have enough salt, they can stay in the village without contact with the outside world. Transportation: As Bamei is far away from cities, you'd better take a coach from Kunming to Guangnan County first. Then take a coach to Bada Village and get out at Fali Village. Then you have to walk about 1 kilometer (about 0.62 miles) to arrive at the entry-cave. Accommodation: For those who want to enjoy local life, living with a local family is a good choice. But the condition might be quite rough because of the absence of electricity. You can also leave Bamei and stay in Guangnan County. For those travelers looking for a lush gorgeous place for a vacation with a lot of great places to see and some awesome scenery, the Babao Scenic Spot in Guangnan is a great place for a very unique vacation spot. Located in the southeastern quadrant of Wenshan, this rare place is home to some amazing karst topography coupled with rivers, waterfalls, mountains, caverns, and forests. The people of this region are lively and friendly and have some of the most unique festivals of any place this part of the world. It’s not the normal stopping place for the average traveler, which makes it all the more special as a unique place to spend a vacation, and well worth the trip. The majority of these karst peaks range from 160 feet high to 325 feet high and are very sharp at their pinnacle; although there are a few under 160 feet. The lazy Babao River winds its way slowly from the Hemei Lake and flows north passing charming villages and farms with plenty of natives along the way. The are 25 rivers that flow throughout this region that all provide uniquely fascinating scenery. 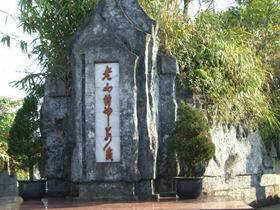 One of the most unique locations in the Babao Scenic Spot in Guangnan is the wind tunnel, and the area of the Old Bridge where the five ancient texts and assorted artifacts were found. This is a very relaxing place to spend a vacation, and perfect for the budding photographer who want some interesting shots in one of the most unique places on the planet. There are two principle waterfalls, known as the Prince Phillip Falls (sān là 三腊) and the Ge Fung Falls (gē fēng 戈峰) that visitors must see while touring through the Babao Scenic Spot. Transportation: Wenshan Puzhehei Airport has Flights from Kuming, Nanning, and Guangzhou . From the airport, take a bus on the four hour ride to the Babao Scenic Spot in Guangnan, Wenshan Yunnan Province. The Yuxian Lake covers a total area of about 109 square kilometers and consists of the main scenic spot of the Bathing Immortal Lake and the other 4 sections: Ting Lake (tīng hú 听湖), Ashe (ā shě 阿舍), Ameng (ā měng 阿猛) and Longsuo (lóng suǒ 龙所). Going into the Yuxian Lake, you will arrive at the two Pearl Islands first. Around the Pearl Islands, you will find the broad lake stretching before you. Then you can go to the Carp Island. If it is winter, you may see groups of red-beaked gulls flying and paddling and fighting for food on the water surface. In the other seasons, you can, of course, see other tens of kinds of birds like pheasants, thrushes, larks, cuckoos and pies. On the seacoast of the Yuxian Lake are three stockaded villages where there live Yi, Zhuang and Miao people. Every time when it is the Flower Mountain Festival of the Miao people, the March Festival of the Zhuang people, or the Torch Day of the Yi people, people of all nationalities would get all dolled up and sing and dance. At this time, you can fully enjoy the Lusheng (lú shēng 芦笙) Dance of the Miao people, the String Dance of the Yi people, and the Straw Men Dance of the Zhuang People. Transportation: Take regular bus from Wenshan to Yanshan or from Kunming to Yanshan. The main sights here are: the site of the Counter-Attack in Self-defence in the Laoshan Mountain, the Forest Sea in the Laojun Mountain, the deep and serene groups of Karst Caves, the Cat Jumping Gorge, the irregularly changing cloud sea, the many rare plants, and the Tianbao Frontier Trade Port. All in all, the scenic spot of the Laoshan Mountain is an ideal place for frontier trade and shopping, tour abroad, scientific and geological research, and the research for the diversity of life-forms. Transportation: take regular bus form Wenshan City to Malipo. The Puzhehei Airport of Wenshan is located in Yanshan County. It is a national lateral airport. The tourists can arrive in Kunming by air first, and then take buses to Wenshan. Highways are the major means of transportation in Wenshan Region, with Wenshan County as the transportation center. The Beiqiao (běi qiáo 北桥) Passenger Transportation Station of Wenshan County is on the Beiqiao Road (Tel: 0876-2122886). Every day there are buses going to all parts of Wenshan Region, to Nanning (nán níng 南宁), Yulin (yù lín 玉林), Baise in Guangxi, to Xingyi (xīng yì 兴义) in Guizhou (guì zhōu 贵州), and to Kaiyuan (kāi yuǎn 开远), Gejiu (gè jiù 个旧), Mengzi (méng zì 蒙自), Pingbian (píng biān 屏边) and Hekou (hé kǒu 河口) in Honghe (hóng hé 红河) Region. If you take Volvo to Kunming , that will cost you 101 yuan per person; if it is Eveko, that is 62 yuan per person. The Nanqiao (nán qiáo 南桥) Passenger Transportation Station of Wenshan Region is on the Nanqiao Road (Tel: 0876-2122343). There are every day buses going to Yanshan, Guangnan and other parts in the Wenshan Region, but no buses going out of the Region. Almost all buses of the two Passenger Transportation Stations are installed with air-conditioners, and are in good conditions. There are taxis like Xiali and Santana. The starting price is 5 yuan. On the buses there are conductors. The price is 0.5 yuan or 1 yuan, and that depends on the length of the travel.